Little Herds’ Robert Nathan Allen with toasted crickets. Experts predict the world’s population will increase to nine billion people by 2050. That’s two billion more mouths to feed. And Robert Nathan Allen says an eco-friendly protein to help nourish the masses is insects. Compared to say a cow, where we can only really eat about forty percent of the cow, with insects; we can eat most if not all of them. 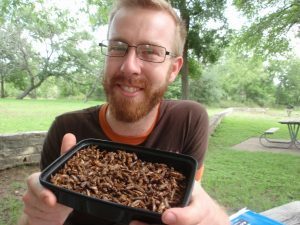 Allen founded the nonprofit Little Herds to educate the public about insects as a nutritious alternative food source. Insects are high in protein and rich in fiber micronutrients. Currently 70% of agricultural land supports meat production, which limits the industry’s future growth. So, with insects, we can raise them in a modular fashion vertically on a fraction of the land as traditional livestock, with a fraction of the water, with a fraction of the feed, and end up with more nutritional valuable protein. It’s a huge leap from eating burgers to bugs. For the brave ones, Allen recommends obtaining edible insects from farms that raise them for human consumption. That way we can assure that they’re raised in a hygienic, safe, clean environment. We can make sure that there’s no risk of diseases and parasites, and we can make sure tht they’re eating a clean, wholesome diet. According to a UN report, over 2 billion people worldwide already supplement their diet with insects. Intrigued? Learn more about edible insects at littleherds.org. 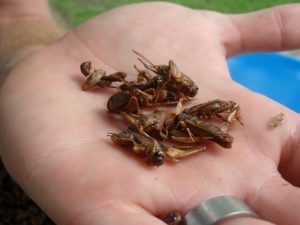 A handful of tasty, toasted crickets. Bugs have a way of showing up just as you unpack your picnic. But what if you welcomed their presence? No, not as guests… as snacks. They really do have a crunch [crunches]; really similar to roasted nuts. That’s Robert Nathan Allen, who was just then crunching a toasted cricket. He’s founder of the Austin, Texas nonprofit Little Herds. And we focus primarily educating the public and particularly children about edible insects and why and how we can adopt them into our diet. We call eating insects as food Entomophagy; it’s commonplace among 80% of the world’s population. But we westerners steer clear. Once western societies started becoming very agriculturally based, particularly in northern climates, it just became ingrained in our society that insects are dirty. And so, that idea has continued to be passed down generation to generation in these western cultures. Whereas in the tropical environments where the habit has continued, it’s just another food source. The thing is, we already eat more than 400 insects a year without knowing it. Allen says by intentionally switching animal protein for insect protein, we can improve the environment and our nutrition. More on that tomorrow. You are currently browsing the archives for the Entomophagy category.